Ancient Stones - Lothian - 044 Standing Stone, Newhouse, Ratho. This well concealed standing stone stands to 1.75m high and measures 0.90 x 0.65m on plan. In section the stone has a "diamond" shape, with a large section missing at the base on the north side. The stone is well weathered and marked. Not shown on O.S. Landranger or Explorer Series maps. Take the A70 junction off the Edinburgh by-pass. Continue through Currie and keep right on the A70 at Balerno. Look out for a minor road turning right opposite Ravelrig. Continue to the T-junction and turn left. Stop at Newhouse Farm. Easy access to the woodland where the stone may be found is through the metal gate across the road. However, do find out first if paintball activity is in progress. If it is, come back another time. 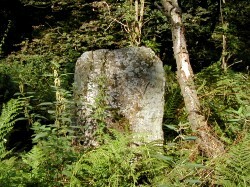 The stone is located approximately halfway into the wood on the side nearest the golf course. It should be easy to see when the vegetation is low but GPS is recommended otherwise. Beside road at Newhouse Farm. Please request permission before parking and do not hinder farm activities. This is quite a location to visit in early September. The vegetation is 6ft high in places and comprises a mixture of bramble, nettle and bracken with the odd branch, drainage ditch and fallen tree thrown in for good measure. All usually placed to trip the unwary. The woodland is also used for paintball games and you never know who might be lurking in the undergrowth. Finding the stone was not easy, even with the GPS. The trees were preventing a good signal and accuracy was down to 16m. Not a problem in open ground but a real problem in jungle conditions. However, more by dead-reckoning than my GPS, the stone was finally located. I suppose if it were always easy, it would not be half as much fun! Also of interest in the area is a massive half-barrel shaped stone lying to the west of the standing stone. It is not easy to find but lies just of the track running in the direction of the Dalmahoy Hotel. The stone measures 2.20m wide x 2.10m long and is about 0.85m thick and has two large fractures. What appears to be a large hole has been dug at the eastern end of the stone. The stone is probably just a natural but is still if interest. The GPS reference is NT 1531 6848.